We often get asked what a day looks like on our Professional Software Development course. We all learn by doing. By building things, making mistakes and focused practice. This is what your days will be centred around at CodeClan and why it’s called an immersive course. Most of your learning will come from being with a tribe of like-minded individuals and building your skills, brick by brick. Every day, you’ll be challenged just beyond your current capabilities. Arriving promptly at 9AM, you’ll be greeted with a warm hello from your fellow students and instructors as we grab a quick coffee, tea or water in the kitchen before the lesson begins. We start the morning off with a stand up. Each cohort comes together in a big circle and one by one gives an update on the successes and challenges they are experiencing at each stage in their learning process. A great way to share stories and build team morale. We kick-off the learning with a recap of homework. Then we learn some new things through code-alongs, lessons and exercises that build on what you’ve already done. A chance to fuel up, go for a walk or grab yourself a break on the sofa. Our kitchens come equipped with appliances to heat and store food and our campuses are a stone’s throw away from nearby cafe’s, restaurants or supermarkets. This is all about learning through doing. The best way. 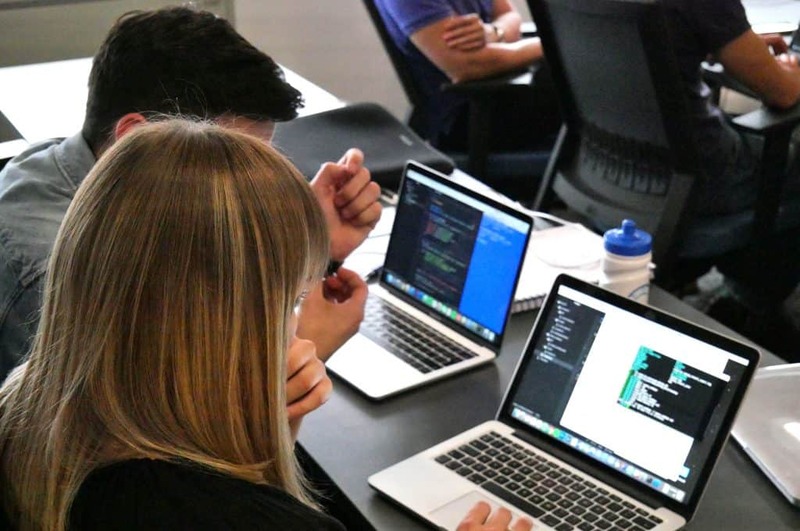 You’ll pair up with a classmate and using best practices like TDD and pair programming, build something that meets the brief given to you by the instructors. We’ll get together after you’ve spent time creating something and discuss solutions and sticking points. You’ll also be able to review a sample solution to consolidate your learning. Yes, homework! Often you’ll stick around and finish it off at CodeClan with your classmates. Alternatively, many students leave for their commute home and tackle the homework later in the evening. Don’t forget you need rest and sleep too though. Sounds like the sort of day you want to have? Check out what else the course has to offer. Our curriculum introduces you to the most popular languages, technologies and best practices used across the Scottish tech industry. Get help finding work in the Scottish tech industry. Our course gives you access to a large network of employers across the country. We’ll point you in the right direction and connect you with the latest job opportunities. There’s one thing our Alumni have in common, they’ve all experienced what its like to re-train and transition into a new career. That’s what makes them a such a supportive community of mentors, friends and Alumni cheerleaders. The Scottish tech industry is buzzing with meet-ups, networking and speaker events. Many of those are hosted at the CodeClan campuses.